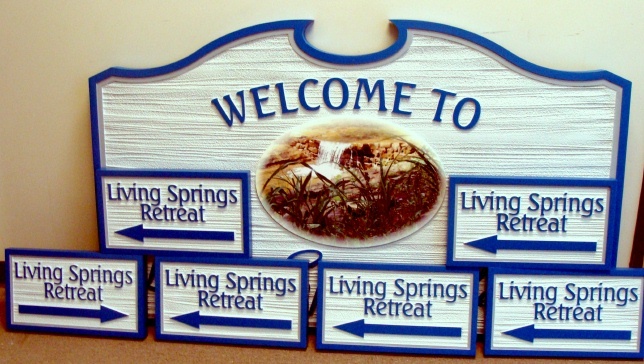 This large sandblasted HDU resort sign for "Living Springs Retreat" features a long-lasting digitally printed cast vinyl applique mounted on the center, to replicate a photo. We use 7 yr lifetime Oracal printed vinyl and further protect it from UV radiation by applying two coats of clearcoat. Vinyl applied this way will last almost as long as artist-painted oil enamels, and is much less expensive. Just supply a digital photo, or tell us what you want and we will find a scene from our stock photos, and we can incorporate it into a dimensional sign. These signs is carved in 2.5-D with raised text and border and sandblasted in a wood grain pattern. After hand-painting, these 7 outdoor signs are clear-coated twice as extra protection against UV radiation and rain and snow. These signs can be mounted on a gate, a wall, on a post . The large sign can be mounted between two posts, or hung from a wood or iron hanger from eye-hooks on the top of the sign.